25mm Hard Enamel Badge with pin bar, safety clutch fitment. ‘Dog Groomer’ design. 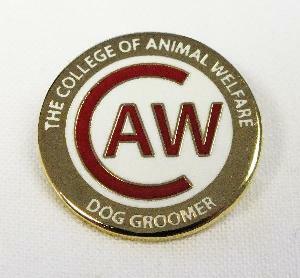 In order to purchase this badge you must have achieved either a level 2 or level 3 City & Guilds Dog Grooming qualification throught The College of Animal Welfare. In order to purchase this badge you must have achieved the ‘City & Guilds Level 3 Certificate in Introductory Dog Grooming qualification’ through The College of Animal Welfare.